Any headshot client that I schedule will have her hair and make up done with one of our certified artists to give a beautiful pulled together look so I thought, why not start a boudoir session with a headshot session?! Make up is included in a boudoir session, so it only makes sense for us to help you put your “best face forward”. Many of Demi Girl’s boudoir clients are professional women. 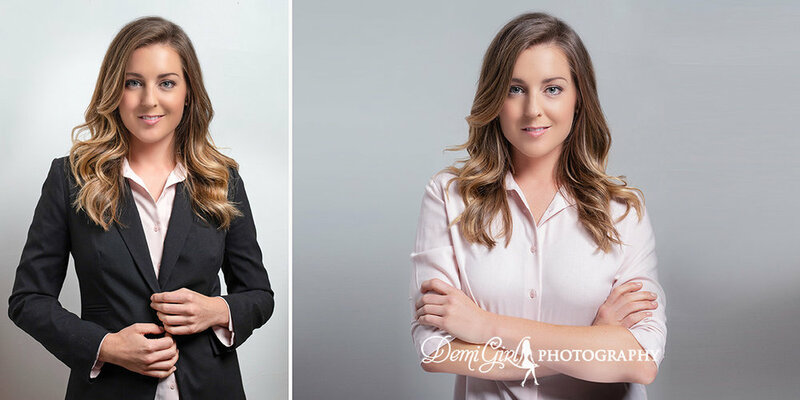 While I absolutely love creating gorgeous boudoir images of all my clients, I realized that many of these women may have the need for a gorgeous professional headshots. I found that by doing a headshot before we start her boudoir session, it could be a great way to kill two birds with one stone. I’ve had a few clients return to the studio after a few months of shooting her boudoir session because of a job promotion or new job search and it makes sense to offer these shots before we get started with a boudoir session. I’ve also had women considering a boudoir session come in for a headshot session to get “warmed up” and build up the courage to bare it all for the next time she returns to the studio. Either way, I’m happy to shoot professional headshots for my clients before, during or after she comes in for a boudoir session. I find that no matter who you are, men or women, don’t necessarily love being in front of the camera. I try to make all of my clients comfortable before we start shooting just by hanging out and getting to know one another so it simply feels like hanging out with a friend. My clients are coached the entire time with any session I shoot for them. I’m excited to offer professional headshots that my clients are proud to show the world! We will also travel to corporations and businesses looking to shoot headshots for their staff. This is a great way to showcase your amazing staff and create high quality images to attract new business. You don’t get a second chance to make a first impression so it’s vital to make it count!